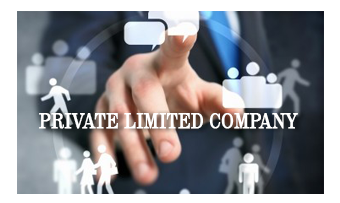 Private limited company is the most popular form of business entity. To incorporate a private limited company minimum number of two shareholders and two directors are required maximum upto 200 shareholders and 50 directors are allowed. A private limited company has all the advantages of partnership namely flexibility, greater capital combination of different and diversified abilities, etc., and at the same time it has advantages of limited liability, greater stability and legal entity. Limited Liability means the status of being legally responsible only to a limited amount for debts of a company. Unlike proprietorships and partnerships, in a limited liability company the liability of the members in respect of the company's debts is limited. This means any loss or debts which is purely of business nature will not impact, personal savings or wealth of an entrepreneur. Private limited companies enjoy tax advantages in addition to limited liability. These companies pay corporation tax on their taxable profits and tend to be exempt from higher personal income tax rates. Forming a company instead of continuing as a sole trader or sole proprietor opens the door to more tax-deductible costs and allowances redeemable against profit. There are various prescribed Rules and regulation for Formation and incorporation of public limited company in India under the new Companies Act, 2013. If you are prompt with all the required Documents. TheStartupPoint will help you in incorporation of Private Limited Company in 25 to 30 working days, subject to legal processing period. Two or more Directors associated must apply for Digital Signature Certificate while submitting self attested address proof and identity proof. Once the required documents and details are provided; our expert will fill the form Online. This process will take a days time to complete. All the directors need to apply for the Director Identification Number. You need to provide all the required documents and details; our expert will fill the form Online. This process will take a days time to complete. As soon as we apply for the DSC, we will ask you for the unique name you wish to give to your Company, as well as required documents (scanned copies) regarding the proposed Company and its directors. These will be used to file SPICe INC-32, the Memorandum of Association (MOA) and Articles of Association. At this stage, you will also need to pay defined Government fees for form filing and stamp duty. The Incorporation Certificate will be approved at the end of this process. Every Public Limited Company needs a registered Permanent Account Number (PAN) and Tax Account Number (TAN). We will make the application online ourselves; you need to provide the all required Documents. The PAN and TAN will be couriered to your registered office address in 21 working days. Is it allowed to change registered office address of the company after registration ? Yes, a company can change its Registered Office address any time after following specified procedure. The changed address can be situated within same city, same state but with different ROC, one state to another state. I am carrying business as a sole proprietor / partnership, can I register a private limited company ? Yes, A Private Limited Company can be set up following the provisions of Companies Act, 2013. What is the maximum number of shareholders in a private limited company ? Maximum number of Shareholders in a Private Limited Company is 200. Is a Private Limited Company Suitable for making FDI in India ? Yes. Private Limited Companies have been a popular form of business entity amid Foreign Investors for making Direct Foreign Investment (subject to FDI Guidelines) in any country, by means of a wholly-owned subsidiary, a joint venture, etc. Can two Foreign Companies form a Company in India ? Yes, Representatives of these companies may be appointed as Directors in Indian Company, one of them should be Indian Resident. Is it mandatory for Directors of a foreign company to take DIN ? Can registered office may be situated outside India ? No, it must be situated in India Only. Can a Company may be registered without any object ? No, as per Indian laws a Company must have a Lawful object at the time of Incorporation.